Lenny Kravitz first tour in South America 8 dates, 27 dates in the US and 2 in Canada and 26 dates in Europe for the summer! Nikka Costa Confirmed as Opening Act on All U.S. Dates! ELECTRIC CHURCH: ONE NIGHT ONLY! MIAMI, FLORIDA- Tuesday, February 8, 2005 - Following the announcement of his first ever tour of South America, Lenny Kravitz has released the details of the US leg of his world tour. Lenny Kravitz's ELECTRIC CHURCH: ONE NIGHT ONLY! tour is scheduled to kick off in Dallas, TX on April 5th and will feature the artist performing a series EXCLUSIVE theater dates in 27 cities across the US and Canada. These one-time-only shows promise to be a must-see experience for fans in the US, who have never been able to catch him perform live in such a raw and intimate setting. Tickets will go on sale on Saturday, February 19th. Nikka Costa will join Lenny Kravitz on his ELECTRIC CHURCH: ONE NIGHT ONLY! tour as the opening act on all dates. These limited 27 engagements will feature Kravitz performing both new and classic material from his expansive career. Kravitz is looking forward to hitting the road again in the States after having to reschedule his 2004 US tour due to family reasons. "I haven't been able to play for my fans in the US since 2002, so I'm really looking forward to these shows," said Lenny Kravitz. "When I was planning my American tour, I decided that I wanted to get back to my roots, strip down the production and do something different. I haven't played theaters in years, and don't know when I'll be able to do it again, so this tour is going to be a great way to get out there and really connect with my fans." Lenny Kravitz's ELECTRIC CHURCH: ONE NIGHT ONLY! tour is happening in conjunction with the release of his 7th studio album Baptism. The record was written, produced and arranged by Kravitz, who also performed all the instruments on the album, including bass, piano and drums, in addition to the guitar. Baptism features the chart-topping singles "Where Are We Runnin," and "Lady," which is currently a massive multi-format hit with an audience nearing 40 million to date. 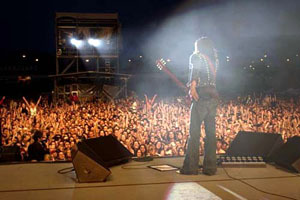 Throughout his career Lenny Kravitz has achieved tremendous critical acclaim and commercial success with a succession of groundbreaking album releases. One of the preeminent rock musicians of our time, he holds multiple gold, platinum and multi-platinum certifications from the RIAA for his albums and singles, and has earned an array of accolades, including Grammy Awards, MTV Video Music Awards and American Music Awards. In 2001, Kravitz set a Grammy record for the most wins in the "Best Male Rock Vocal Performance" category when he took home his fourth consecutive award for his single "Dig In" (previously winning for "Again," "American Woman" and "Fly Away"). In 2003, he received his fifth Grammy nomination in the category for "If I Could Fall In Love" off his 6th studio album, Lenny. Kravitz's North American theater tour comes on the heels of the artist's first-ever tour of Latin America, which will kick off in Mexico City on March 4th. Following the US dates, Lenny is scheduled to tour both Europe and Russia. Lenny was on tour in Europe in June and July, then in the US in September and October. All venues in detail. * If you know concert dates which are not in our database, please post it on the forum. Thanks! Last update, October 2004 : Lenny hit the Top 40 with Lady.